This article by Patty Wentz of the Willamette Weekly in Oregon is a refreshingly humorous look at Gifting Clubs. The Alameda living room is packed. Women fill the couch, balancing plates of cheese and crackers on their knees--they crowd the piano bench, curl on the floor and spill through the dining room entryway holding glasses of red wine. They are young hipsters, lesbian couples, elegant WASPS and aging flower children. The gathering is semi-secret, only for the invited, and everyone uses first names only. Men are not allowed. This is a woman thing. "Men would only want to make rules," a middle-aged woman named Pamela says mockingly, as her girlfriend laughs at the truth of that. "This is my chance to connect to other women," says one fresh-faced woman with long mouse-brown hair. "There are good things I want to do." Besides, she says, her savings were sitting stagnant in the bank, earning low interest, while she sees fortunes being made in financial markets. "What was I supposed to do, call Dean Witter and ask them what I should do with my money? I don't think so." The other women nod. Some talk about how they have paid off their school loans or those of their children or finally helped their aging mothers. One mentions setting up a fund to help Hispanic women fly home to Mexico to escape abusive husbands. They all agree: Sisterhood will raise them up from the bonds of their second-class-citizen status. These women know money means freedom and power, and they aim to get some. Welcome to the Women's Dinner Party, the latest pyramid scheme to hit Portland. For the past four months, metro-area women have been going to clandestine meetings to learn how they can help other women--and themselves--change their lives by getting rich quick. Part safe house, part slumber party, part revival meeting, the gatherings have been held as often as four nights a week. While it's impossible to know how many people belong, members say that more than 200 women have each paid $5,000 in cash in hopes of reaping a $40,000 jackpot five to seven weeks later. If true, there is at least $800,000 to $1 million of unreported, unearned cash in the safety deposit boxes, dresser drawers and bedroom closets of women around Multnomah County. The steep initial investment and high payoff appeals to a mostly middle-class crowd, the kind of women who have access to five grand (although half-spots for $2,500 are available) and are willing to hand it over to a stranger. The Dinner Party might look like a clever gifting system that skirts the IRS, but in reality it's nothing more than a basic pyramid scam, similar to a chain letter. Pyramid scams have been around as long as there have been people who want to believe they can get something for nothing. They've been described as being like wildfires, flaring bright until they're stomped out, only to spark again in another location. As much as its members want to think otherwise, the Dinner Party isn't about women helping women; it's about women cheating women. It's an illegal scam that's bound to collapse on the very people it claims to be empowering. In other words, sisters are doing it to themselves. When they first hear about the Dinner Party, skeptics wonder how anyone could be so stupid as to join. But the most successful pyramids have a hook that appeals not just to greed but to something higher, to social or political affinities or emotional connections, allowing people to suspend logic in pursuit of the payoff. Sometimes it's religion, sometimes it's race, sometimes it's political affiliation. For this group, it's a pair of X chromosomes. Rebekah Folsom, until recently a technical writer at Marketing One in Portland, was invited by a friend to a Dinner Party meeting last month at Northeast 22nd Avenue and Knott Street. Folsom's friend boasted that she had joined a women's group that was going to help her get out of debt. "At first, I thought of it as a board of women with money," she says, "that she'd met some nonprofit group." Folsom was keen to find out more. She is carrying school loans and $23,000 in medical debt. She was intrigued by the idea of women taking care of their own. Moreover, she trusted her friend, whom she knew through volunteering at a women's social-service agency. "God, I was thrilled. I wanted very much to believe some generous feminists had an organization that could help me out." She found something else entirely. Victoria is beaming like Tipper Gore at a meeting of Iowa grange wives. Big-boned and blond, she wears a corporate-casual outfit of khakis and a blazer. Paula Sanderson is hosting the meeting at her Irvington home tonight, and Victoria is the "presenter." You're here, Victoria says, because you have been invited to take part in an exciting women-based financial opportunity. The system has been working in Seattle since last spring, she says, and in Canada for 10 years. Holding a small white board, she draws 15 Xs to form the shape of a triangle, with a single X at the top. Each of the Xs is worth $5,000, and the payoff is $40,000--a 700 percent return. Because it is, after all, a "dinner party," she explains the process in terms of food--calling new members "appetizers" and saying women progress up the ladder until they reach the "dessert" level and the payoff. "That's when she gets her 'just desserts!'" Victoria gushes. When a woman signs up to join the club, Victoria says, within 24 hours she will get a phone call telling her who the "birthday girl" is. That's the woman to whom the new "appetizer" will be giving her $5,000 "gift." Seven other appetizers join in to make a combined $40,000 "gift." The birthday girl sets up the meeting, but Victoria urges the appetizers to be creative in giving their gift (which is given in cash, preferably small bills). Some have delivered the money in a box of chocolates or a bouquet of roses, or stuffed in red peppers with clever notes. Just think what $40,000 would mean, Victoria says. Women rarely have access to big chunks of money like this. It's enough to pay off credit-card debt or school loans or put a down payment on a house. No need to grovel before Regis Philbin. Women can take care of their own. The group operates on trust and integrity, Victoria explains. There are no printed materials and no leaders. Volunteers give the presentations and track the progress of the members on computer. Several women attest that while they were at first nervous about taking so much money out of the bank in cash, they soon found the experience of holding and controlling their own money empowering. And giving it away, they all agreed, was as good as the idea of getting gifted themselves. This isn't a pyramid, Victoria says, as if oblivious to the triangle of Xs she has drawn on the board. It's a circle. A circle of women. She explains that when the dessert girl collects all her gifts, she can leave the circle with her $40,000 worth of presents and "have a nice life," or she can join back up again as an appetizer. Someone asks the essential question: When every woman in the area has signed up, how will they add new members and pay off the desserts? Another woman jumps in to reassure her. There are innumerable women in the metro area, and it's growing constantly. Besides, she says, there are more women than men. At a Dinner Party, emotion roars like a she-lion while logic whimpers forgotten and ignored in the corner. For a single woman to receive $40,000, eight women have to come in at the appetizer level. That seems plausible. But consider that the Dinner Party claims at least 200 members. If each of them is to get the $40,000 "dessert," 1,600 women have to be recruited. For those 1,600 to be paid, 12,800 will have to join. And so on. Three cycles from now, the Dinner Party will need to recruit 819,200 women. Considering there are only about 245,000 adult women in Multnomah County and 1.3 million in the entire state, it's easy to see that sustaining the group is impossible. But Victoria and the other presenters don't want anyone to do the numbers. "They make it sound as if the math is a little out of reach by being very obfuscating," says Folsom, describing a meeting. "That thing they do with the white board doesn't explain anything." Sanderson says that because women have the opportunity to join again, the circle can maintain itself, as if the same money could infinitely cycle through the group. Also, she says, there's no reason the group can't keep growing. It's been growing in Seattle, she says, and she believes the organizers' claim that it came down from Canada 10 years ago. "Wouldn't it be wonderful if it would compound itself all over the world?" It's as if Sanderson and the other members believe they can defy gravity by not looking down. Some of the club members, however, have been unable to silence their consciences completely; they say they planned to go through the cycle only once, as if that would keep their hands clean. Others sense the small window of opportunity and grudgingly admit it's better to have come early to dinner when the feast is still hot than show up late when there is nothing left on the table. Yet they attack nonbelievers as being too linear and too male. At the meetings, members testify that outsiders are opposed to any gains made by women, including the accumulation of wealth. Folsom says when she presented evidence to her girlfriends that they were involved in a scam, she was accused of buying into the system that wants to squelch any advances made by women and minorities. "The thing that made me so mad about that was I wasn't talking about the white male power structure, I was talking about math," she says wryly. "Math knows no gender or color." After the pitch, Victoria puts aside the white board and opens up the floor for questions. The group is sprinkled with veterans who say they come each week for the chance to bond with the other women. As if rehearsed, one of them prods Victoria to talk about how people come up with the initial $5,000. "Well," says Victoria, "some women have used those blank checks that come with their credit cards." Other women say they've taken out signature loans, cashed out 401(k) plans or borrowed from a boyfriend. Victoria waves her hand with glee and says that men can't join but they can "donate." Pamela says she put the $5,000 on her credit card. When she talks about being part of the group, tears of happiness and excitement well up in her eyes at the thought of paying off her debt. Finally, another woman asks the most important question of all: Is this legal? "Good question!" Victoria says approvingly. Members of the Dinner Party include CPAs and lawyers, she says, and it isn't an illegal pyramid for three reasons: There isn't anyone on top raking in the money, there is no central organization controlling the money, and the members don't have to recruit (although they are encouraged to do so and it is clearly in their interest). She adds that the IRS does not require taxes on gifts of up to $10,000 from one person. "But you can report it if you want to," she smiles. "There's a place for that on your tax return. We tell women to follow their hearts and do what they think is best." Victoria adds that while some people want to paint the Dinner Party as an illegal activity, the attorney general's office in Washington state has taken a hands-off approach. Although it may seem that foolishness is punishment enough and that those at the bottom of the pyramid should be left to their own devices, a participant can find herself in both civil and criminal trouble. Gifting clubs such as this are illegal in Oregon and all other states. Despite the reassuring definition put forth at the meeting, a pyramid scheme is simply any system where no products are sold and new money is made only by the addition of new recruits. Pyramids are illegal because they must inevitably fail and the few will make money at the expense of the many. Jan Margosian, consumer information coordinator for the attorney general's office, says her office is investigating Dinner Parties in Portland and in Lane and Linn counties. "We are looking at Portland," she says. "We have names." In Eugene, a similar group moved through the real-estate industry, beauty salons and other places women tend to frequent or work, according to Det. Steve Williams of the financial crimes unit of the Eugene Police Department. The group hit Lane County in July of last year and started coming loose in September when recruiting became difficult. By that time it had spread so fast and far that the wives of high-ranking officials in the Eugene police department were being invited to the meetings. When the group started falling apart, Williams says, his office started getting calls from people who were afraid of being ripped off. The club had hit saturation point, and organizers were desperate. "They were changing money in the parking lot, like a drug deal," he says. "We had one local business where so many people were playing it was becoming intimidating to the women who were not." Just last week, the chief of police in Pendleton notified the state attorney general's office, suspecting the Party has come to his town. Margosian considers the Women's Dinner Parties particularly insidious because of their sophisticated sales pitch, which ultimately turns women against women. "How empowering is that?" Margosian asks. "How much of a friend are you being if you're ripping off other women?" Paula Sanderson maintains that the Dinner Party meetings she's been holding at her house on Monday evenings are not illegal. "We come, we eat, we talk," she says. Trying to reason with her is as frustrating as giving a cat a bath. WW: "The Dinner Club fits the criteria of a pyramid scam, and pyramids are illegal." Sanderson: "Multi-level marketing is legal." WW: "Yes, but in multi-level marketing, there is a product." Sanderson: "What about the stock market? Are you trying to tell me the stock market isn't a pyramid?" WW: "In the stock market, you're buying equity in a company or trading actual commodities." Sanderson: "We have a commodity." In a sense, she's right. It's the same commodity that made Waiting to Exhale and Beaches top-grossing movies. But it's more than cheap sentimentality. It's the connection that women share--the Sisterhood. The Sisterhood that says--when the boys are getting the good jobs, your man has disappeared, your work is undervalued and you're underpaid--your girlfriends will always be there. The Sisterhood that says the system isn't working for us, and we need to create our own rules. "I trust women," Sanderson says. "If it were men, I wouldn't trust it. If I have to explain that to you, you have totally missed the point. Come to another meeting." 05/02 - For almost a year, dozens of women from Chico, California and neighboring communities have been meeting in private homes and via conference calls as part of a "dinner circle" called The Women's Circle, or Women Empowering Women, which claims to empower women by creating a monetary and emotional support system that deftly operates outside of male- and media-dominated mainstream financial society. At the secret sisterhood meeting, women are told those dreams can come true if they come together to subvert the dominant paradigm--to the tune of a $5,000 "gift." Some elements of the structure seem almost cult like, such as the closed-circle secrecy that builds a false sense of intimacy and the new-age ideals and terminology used as a recruiting tool to get more "women of integrity" involved. "It's not about money. It's so much more," says one woman, speaking with the intensity of a Baptist preacher at a revival. "We're holding on to each other's dreams." In communities nationwide and overseas, women have similarly sought to have their dreams fulfilled through "gifting circles" only to watch their money disappear when the circle breaks apart once the supply of new members is exhausted, or someone runs to law enforcement or the media. The California Attorney General's Office confirmed that they are illegal and stated people who conduct an "endless chain" can be prosecuted for a misdemeanor or felony under Section 327 of the Penal Code, or Section 484, "your general theft statute." In New Mexico the Women Empowering Women setup resulted in four grand jury criminal indictments. More than 400 people who bought into the New Mexico scheme have applied to get at least some of their money back through a restitution program that may let those who profited avoid prison time. Believers counter that it's not an endless chain for several reasons: because it's not an investment and the women give the money with no promise of any returns; the exchange is between a giver and recipient (not the group); the IRS allows people to give away money; and there's no product involved. Plus, there's no fixed hierarchy. If you get your $40,000, you're off the top, but you can choose to pay and re-enter at the appetizer level. But no matter how pure the intentions of the women who join, it is based on somebody beyond you getting hurt. It takes eight to pay one, which means that eight out of nine people have to go home empty-handed, even if the cycle progresses to infinity. The moment it begins there is the certainty that 88 percent can't be paid. It simply transfers the money from 88 percent and gives it to 12 percent. For the full story and some excellent graphics see the Just Desserts article by Devanie Angel. Sacramento sheriff's detectives Wednesday arrested four women, alleging they took in hundreds of thousands of dollars by promoting a pyramid scheme and secretly cheating in the "gifting" club marketed as empowering to women. The four women -- described as major promoters of Women Helping Women dinner parties -- surrendered Wednesday morning with their attorneys at the Sacramento County Sheriff's Department. Those arrested were Cheryl Lorraine Bean, 54, and Anne Marie King, 47, both of Fair Oaks, and Pamela Ann Garibaldi, 57, and Cathy Louise Lovely, 49, both of Rocklin. Authorities said Bean is a former Pacific Bell human resources officer, Garibaldi is a part-time English professor on leave from Sierra College, and King is co-owner of a Roseville Montessori school. Lovely was described as not working and having no source of income other than gifting parties. The women surrendered without comment, but one of their attorneys, Bill Portanova, said they have been unfairly labeled. "These are PTA leaders, den mothers, baby sitters and career women, present and retired," Portanova said. "They were playing a sort of parlor game in the same way that a man might bet on a football game. It's devastating to them after lives of law-abiding citizenship to be characterized as criminals." Authorities say Bean was a leading regional director and the other women were area "chart monitors" in a scheme that drew 10,000 women and took in as much as $12 million. Sheriff's Lt. Tom McMahon said the four women each reaped more than $100,000 in personal profit from multiple "birthdays" on the dinner party circuit. At the parties, individual women or groups of women pooling their money give $5,000 to a "birthday girl" to secure one of eight "appetizer plates" on a club chart. As more women come in they can advance up the dinner party ladder to the "soup and salad" level, then to the "entree" and ultimately to the "dessert" level -- where the "birthday girl" gets $40,000 in cash. But Sacramento County Sheriff Lou Blanas said the chances of other women cashing out as the birthday girl decreased because some of the promoters -- including the four women arrested Wednesday -- were secretly manipulating the charts. "Our investigation has uncovered a fraud within a fraud," Blanas said of the Women Helping Women circuit. "The money is systematically being manipulated by 'chart leaders' and organizers, significantly reducing the chances of others." Portanova said that the arrested women were merely participants at dinner parties and that there isn't any evidence they manipulated charts. He also said Women Helping Women "has no high corporate structure." The four women were each booked on suspicion of felony conspiracy to cheat and defraud, and felony violations of state securities laws and the California endless chain statute. If convicted, they face up to three years in prison and fines of up to $10,000 per offense. The California Department of Corporations also is considering seeking separate civil penalties for alleged violations of state securities laws through false claims in marketing the gifting scheme, said Jo Dunlap, a supervising attorney for the agency. The arrests followed police raids on the homes of six other women Tuesday night, including two residences in Rocklin and one each in Granite Bay, Sacramento, Fair Oaks and Colfax. Six houses were searched Sept. 16, leading to Wednesday's arrests. More arrests are expected in the investigation into a gifting club phenomenon that has spread throughout the region despite warnings from district attorneys or sheriffs in Sacramento, El Dorado and Placer counties. "Over the last four months my office has fielded inquiries about the Women Helping Women scheme and we have consistently indicated this is illegal," said Sacramento County District Attorney Jan Scully in a press conference announcing the arrests. "The promoters have said, 'If this is illegal, why hasn't anyone been arrested? Why hasn't anyone been prosecuted?' Today we're answering that." Amid gracious dinner parties and the festive atmosphere of a girls' night out, Women Helping Women was marketed as being empowering for women. "Birthday girls" would testify about how they could pay off bills, aid ailing relatives, leave abusive relationships and elevate their lives. Many participants were fiercely loyal to the gifting circuit, discounting law-enforcement warnings and condemning critics as "anti-women." Some parties were organized around charitable donations, but authorities say Women Helping Women has no ties to legitimate charities. "It should be named Women Fooling Women," Scully said. On Wednesday, Blanas said authorities are investigating another woman, who hasn't been arrested, for possibly manipulating gifting charts to earn "as much as $400,000," including the bounty from eight "birthdays" in a five-month period. Undercover officers infiltrated dinner parties and recorded activities. Authorities said Bean was the virtual regional director for the scheme and a regular dinner party circuit speaker who repeatedly made false claims that the activity was legal. After Bean took a leave from her corporate job, sheriff's Lt. McMahon said, she earned full-time income on the gifting party circuit and was rewarding herself handsomely, including $80,000 in home remodeling. According to reports, Bean's alleged manipulation of the dinner party charts included inserting her husband under the name "Paulette." Authorities described Lovely as an "area monitor" for gifting club parties that took in more than $1 million. McMahon said Lovely profited more than $100,000 through multiple "birthdays." He said she recently paid $27,000 cash for a new Volkswagen Jetta and then insisted that the car salesman leave no paper trail. "She got into an argument with the salesman about filing the sales tax paperwork," McMahon said. He said authorities confiscated the car after Lovely "couldn't show us that she had the money (in a bank account) to legitimately buy the car." According to materials seized from her home, Lovely tracked more than 25 "chart leaders" running Women Helping Women gatherings and compiled phone numbers, e-mail addresses and other information for gifting activity as far away as Bakersfield. Authorities say Garibaldi brought two adult daughters into the scheme and the trio reaped a profit of at least $185,000. In an arrest warrant affidavit, Sacramento Sheriff's Detective Eric L. White said Garibaldi told investigators she held weekly Women Helping Women parties at the Edgewater apartments in Citrus Heights and recruited some of her students from Sierra College before she went on leave this fall. "Garibaldi said in some instances she has 'sponsored' her students with the pledge amount, which was repaid to her when her students received their birthday presents," White wrote. While the four women and others were profiting, many women were losing out, investigators say. McMahon, who said Sacramento detectives started investigating in June, said women began coming forward saying they had been taken. "People at the bottom of charts that aren't moving are getting wind of people 'birthdaying out' multiple times," McMahon said. "They are becoming disgruntled and they're becoming vocal about the internal fraud." McMahon said authorities are targeting key promoters and don't intend to go after the women who attended gifting parties or put in money at low levels and never profited. 01/04 CHATHAM, ONT - A once-prominent businesswoman who's in a Las Vegas jail after her arrest for skipping out on a fraud hearing has waived the extradition process, paving the way for her return to Canada. Lisa Fulkerson, 33, was found earlier this week near a Las Vegas casino, two months after skipping out on a court appearance in Chatham, where she faces charges of fraud and theft totaling more than $600,000. During a Las Vegas court appearance yesterday, Fulkerson signed documents waiving her right to an extradition hearing, Chatham-Kent police and a source in the U.S. Marshals Service told the Chatham Daily News. That prompted an immediate extradition order, said Chatham-Kent police Insp. George Flikweert. Two officers have already been assigned to travel to Nevada to pick up the woman in the next few weeks, he added. Fulkerson is a past member of the Chatham and District Chamber of Commerce's board of directors who was named entrepreneur of the year in 2001. She will remain behind bars until she is escorted back to Chatham, police said. Her next court appearance is scheduled for Jan. 23 in Las Vegas. Fulkerson's fraud charges are in connection with a so-called pyramid investment scheme. She was picked up Monday by police in Las Vegas without incident after she was recognized by a vacationing Chatham woman who happened to be a former investor. FBI spokesman Todd Palmer said Fulkerson had been working selling lotions and hand creams in a shopping mall kiosk attached to the Alladin Hotel and Casino. Thousands of women across the UK are putting money into dodgy investment schemes, in spite of warnings that they could lose it all. The latest is a get-rich quick scheme called "Hearts", which is sweeping the suburbs. Wherever there is a concentration of 30, 40, and 50-something women with £3,000 to spare - and who understand the meaning of an eight-fold return - the scheme is being punted. "The meetings are full of very glamorous women talking about how much money they'd made on the scheme and what they'd spent it on," says one young woman who lost money in a scheme last year. "There was one women who'd made over £100,000 and had bought her flat with the money that she got back from Hearts." Hearts is a variation of the Women Empowering Women schemes that started on the Isle of Wight two years ago. The scheme is simple. A friend who has already invested £3,000 invites you and a friend along to a women-only party hoping each will invest a further £3,000. At a subsequent party, these guests must bring two more guests of their own, each again prepared to put up £3,000. The scheme is not illegal because the investments are technically gifts to other women, which means they are not covered by investment regulations. And the figure of £3,000 is not an accident: this is the maximum amount that can be gifted to another individual each year without triggering a tax liability. Every new "gifter" has her name entered on the first tier of a pyramid chart. The names of her friends (and friends of those friends) are added on each of the next tiers until the pyramid represents £24,000 worth of gifting - which is then passed back to the first gifter as an eight-fold return on her stake. The catch is that if each of the eight gifters is to turn their money into £24,000, 64 members must be recruited. Those 64 will need to find 512 people who will need 4,096 gifters. And so on. "It's all very cleverly done with formal gifting covenants and there is no mention of formal guarantees on the money invested, so there is no come-back on the women recruiting," says Donna Bradshaw, a director at financial advisers Fiona Price & Partners, which specialises in giving advice to women. She has been contacted by several women seeking advice on whether to invest in Hearts. "I was surprised because I thought all these schemes had collapsed, but they're coming back again, just packaged in a new way." The onus is on each of the stakeholding participants to recruit the necessary numbers of new gifters to make their pay-outs possible. "New recruits are told that, if they really want to make it work, they can and that it's just about wanting it to happen," says Bradshaw. "But they can't go on for ever; eventually, the supply of new members will dry up and the scheme will collapse, leaving thousands of people deprived of their money." The Hearts scheme tries to restrict membership to the comfortably-off and well-connected. It has even tried to get celebrities involved with television presenter Cilla Black initially supporting the scheme, but recently backing away from it. To find new recruits, it appeals to women by telling them they will be helping other women and getting their own back on a male dominated society. Although there is no central organisation literature is distributed to new recruits at meetings. "There was some information, but it consisted of a few badly photocopied sheets and some stuff downloaded from the internet," says a young woman who went to a meeting, but decided not to sign up. Printed forms feature flowery lettering and heart logos. They are full of touchy-feely words and phrases such as "supporting other women" and "standing up for ourselves against men". One flier claimed: "Our main goal is the empowerment of women in providing for them the financial and emotional abilities to support themselves and their loved ones." Another doing the rounds at these meetings says: "We are literally creating a new economic experience. The old belief of having to work hard for anything worthwhile is changing and shifting with this process." Judging the impact of the schemes is difficult because there are no central records. But Les Henderson, who runs the website Crimes of Persuasion, ( www.crimes-of-persuasion.com ) says thousands of women have joined such schemes in the UK. Others have predicted as many as 600,000 people are involved. Henderson says the rhetoric used in the Hearts scheme is in line with other pyramid plans around the world, many of which concentrate on personal contact and are geared towards a specific group of people. Schemes in the US are run under names such as Ya-Ya Sisterhood, The Dinner Party Scheme, Breakfast Club and Circle of Friends. Schemes aimed at men are rarer, but they do exist. These have more macho names such as Pit Stop and Engine Driver and involve men starting off as firemen and moving up the pyramid to become the driver. In Australia there is a scheme open to both sexes called Giraffe World. "Women are targeted because they're seen as less financially astute," says Bradshaw. "It's mainly aimed at women who stay at home and look after the kids and is wrapped up in the image of an exclusive club." She predicts that Hearts will eventually collapse, like all pyramid schemes, leaving thousands out of pocket. "Pyramid schemes of one sort or another crop up every couple of years, but they always end up this way, with the overwhelming majority losing their money," says Bradshaw. On the Isle of Wight the Hearts scheme faltered within months because the small population could not sustain it for long. "At one point there were over 300 schemes running with some appearing in schools started with £10. After a while they just dried up, there were not enough people to sustain the investments," says Richard Stone, the island county council's trading standards manager. Stone says he is amazed that people on the mainland are still signing up. "I can't understand how people can be so stupid as to think that they can benefit from these types of schemes," he says. "How can people have such short memories?" Pyramid gifting schemes are illegal in many parts of the US, but not in the UK. "The only remote possibility of getting some compensation is that if you can find someone with responsibility in it you may have a case of fraud," says Stone. "But this is very unlikely and there have been only a few people who have won their cases so far." Trading Schemes regulations of 1997 only cover schemes that involve the purchase of a product. "When the Financial Services Authority came into place there was a lot of thought that they should have been able to cover this money marketing scheme. "But it was taken out of the FSA's remit on the same day the trading Scheme Act was introduced in 1996," says Stone. 07/10/04 - RAPID CITY, S.D. - The state Attorney General's office is warning South Dakotans about an illegal pyramid scam masquerading as a so-called "gifting club." Attorney General Larry Long said the scheme is similar to one that swept through Rapid City, Watertown, Sioux Falls and other cities in 2000. "Many involved in the clubs are ... targeting their friends, neighbors and relatives with claims that a $2,000 gift will quickly become a $16,000 reward," Long said. A gifting club is a classic pyramid. Participants put their money into a pool and must find new contributors to keep it going. Recruits add cash and go out to find more folks. Players who get in early get paid, but the pyramid inevitably collapses and latecomers lose it all. Long said South Dakotans put more than $1 million into gifting clubs in 2000 before they finally caved in. Long would not comment on whether a new criminal investigation is underway but said the latest scheme seems to be centered in Pierre. "We're trying to put a lid on it before it gets rampant like it did the last time," he said. Pyramid schemes tend to be cyclical. 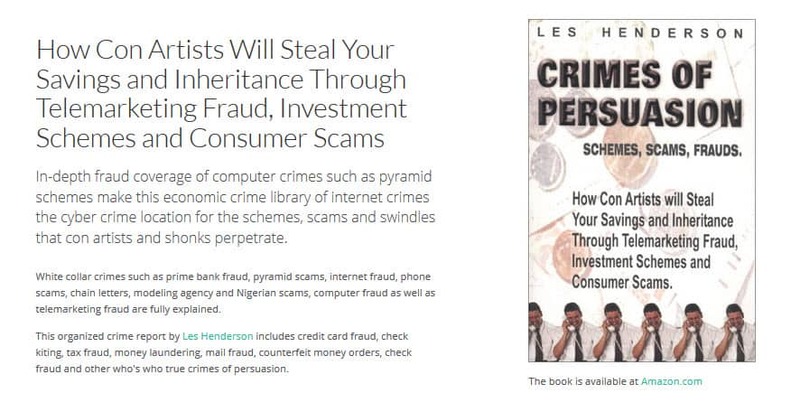 Every few years, the scams come back dressed up with new names and new structures that make them seem different from past scams, Long said. Sometimes they are touted as fund-raisers for a good cause or an empowerment program to help people help themselves. Sometimes they are nominally attached to a product line and touted as a multilevel marketing program. But if the program relies on new investors instead of product buyers, then it's a pyramid scam, Long said. In the 2000 Rapid City case, 34 people - including some business owners and government officials - were prosecuted for their role in the scam. Authorities have not said how much money was involved in the scheme, but confirmed that about $480,000 changed hands in a single day in Rapid City before the scheme collapsed in mid-June. Most pleaded guilty or no contest to charges of deceptive trade practices and several people lost their jobs. 07/30/01 - PIERRE — About $1 million will be repaid to people who were duped in a pyramid scheme launched last year in several South Dakota towns, state Attorney General Mark Barnett said Monday. Barnett said he was tipped off about the scheme by bankers in Milbank and Watertown, who said many elderly people were withdrawing money from their accounts to join a so-called "gifting club." Those who paid $2,000 were asked to recruit new members to do the same. Eventually, each person was supposed to get $16,000. "An awful lot of the folks who were at the bottom of these pyramids and paid in all this money were promised that it was perfectly legal," Barnett said. "I think a lot of them believed that and were talked into a scam." The attorney general said his office prosecuted several people who were involved in the illegal pyramid scheme, and state's attorneys in Brown, Pennington and Minnehaha counties did likewise. Barnett said his primary focus has been to stop the pyramid from spreading and to return money to people who lost it. "Basically, what we're doing is making everybody give the money back to the people at the bottom of the pyramid," he said. "We prosecuted a number of people who were organizers. I don't that we'll ever figure out who got it going in South Dakota. These things cross state lines very easily." Barnett said his office has recovered and returned $84,000 in Milbank; $383,000 in restitution has been made in Watertown, with $144,000 more to be recovered there; $225,700 has been received in other areas of the state, and $104,000 is yet to be recovered. People who were involved in the illegal pyramid and voluntarily came forward were not prosecuted so long as they agreed to repay the money they received, the attorney general said. "We're confident that the people who owe it are going to pay it off," Barnett said. "Once they figured out it was not legal, the vast majority of folks wanted out as fast as they could."